Campaign Maps – The Easy Way! Wargame campaigns have been on my mind a lot recently, after reviewing William Silvester’s book on the subject. I’ve dusted down my copies of Tony Bath and Don Featherstone’s ground-breaking books covering the same topic, and have been mulling over some of the possibilities. All three books spend time discussing that first essential of any campaign, however modest or ambitious – the campaign map. In this regard, it’s surprising how little things have changed over the years. Don’s book was originally published in 1970, with Tony’s following a few years later (though it subsequently went through several reprints). William Silvester’s book came out just two years ago. All three books consider the various types of drawn or printed map that are available, and the options for measuring and recording map movement. Back in the ‘good old days’ the possibilities for acquiring suitable ready-made maps were somewhat limited, and could be expensive. Old classroom maps of the biblical Middle East, tourist souvenir maps, and Ordnance Survey Maps were among the most popular (and, in the first two instances, rather quaint) options. Map movement could be recorded using plastic overlays and marker pens, or coloured pins, always bearing in mind that the map itself was valuable enough to be treated with respect and re-used again and again. This is certainly the approach that most immediately appeals to me. Creating my own mythical continent, peopled with a mixture of ancient and mythical nations, has an innate ‘wow’ factor to it. The opportunity to give my various DBA and HoTT armies a run-out against each other, as part of an over-arching narrative, feels too good to resist. I’m planning to start work on this shortly! So what options are there for creating my map, and for tracing movements on it once it’s been brought to life? My drawing skills are not exactly my strong point, and it would certainly be nice to produce something that has more visual appeal than a rough hand-drawn map. And working with a ‘physical’ map, drawn up on squared or hex-based paper – or using a square or hex acetate overlay – sounds like a rather messy option in this digital era. In the past I’ve tried one or two cut-price computer-aided drawing packages (CADs), but I’ve found them a bit fiddly to use, and the results less than impressive. Nor has the end product solved the problem of logging and marking map movement as a campaign progresses. So I’ve got to thinking whether other options might be available – preferably ones that come in at a budget price. The solution, it turns out, was close at hand all along. And I’m sure it’s one that has occurred to other wargamers too, so I certainly wouldn’t presume to claim any originality for the idea! Like many other gamers, I’ve spent an inordinate amount of time over the years playing the various incarnations of Sid Meier’s excellent computer game Civilization, with Civ4 my favourite version. Now, Civ4 happens to have a fantastic in-game editing facility called WorldBuilder. Indeed, one of the keys to the success of the game is the ease with which an enthusiastic community of online gamers is able to create new scenarios for the core game, and – crucially for me – new maps and worlds as an essential part of that. Over the last year or two most of my games of Civ4 have been based in worlds that I’ve either tweaked or that I’ve created myself from scratch. 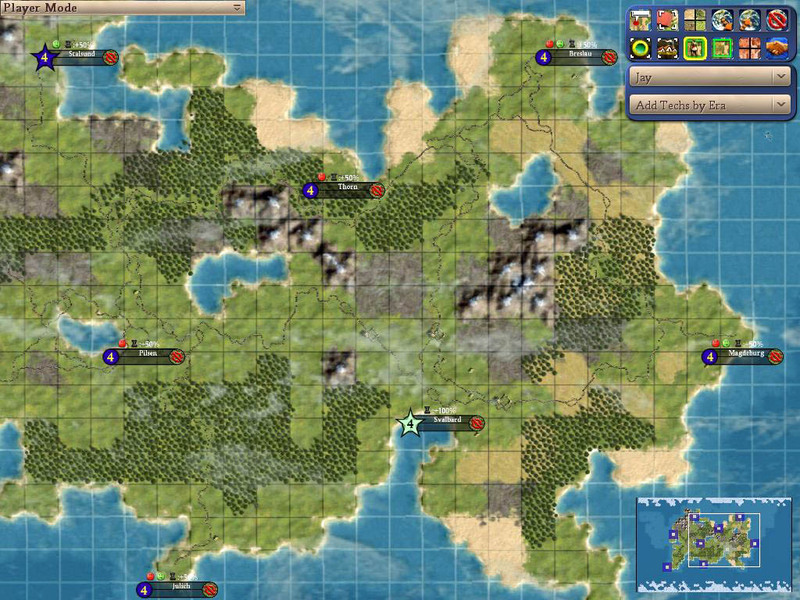 Civ4‘s WorldBuilder – which comes free with the main program – may seem a little daunting at first, but with a bit of practice it turns out to be straightforward and intuitive to use. The results, once you’ve learned the basics, are visually impressive and highly flexible. You can build an island, a continent or indeed a whole world to your own personal specifications, then drill down to whatever level of detail fits with your campaign requirements. You can add production facilities, resources, fields, mines and buildings to your cities and their environs. You can build new roads and railways, surround a strategic location with a string of forts, or colonize an island to expand your nation’s borders. You can keep it as simple as you choose, or add layers of complexity if fine detail is your thing. Even better, via a few mouse clicks you can go back into that self-created world any time you like to add or change its features and the location of the units depicted on it. You can mark the movement of armies, the capture or plunder of cities, the progress of fleets and supply trains, the stock-piling of munitions and the building or burning of villages, towns and forts. You can use the program to chart small actions or large – to monitor off-table movement in one small corner of your continent, to set and execute an ambush in a wooded valley, or to move whole battalions at the grand strategic level. By opting to switch on the ‘grid view’, you have a built-in tool for measuring map movements, one square at a time. 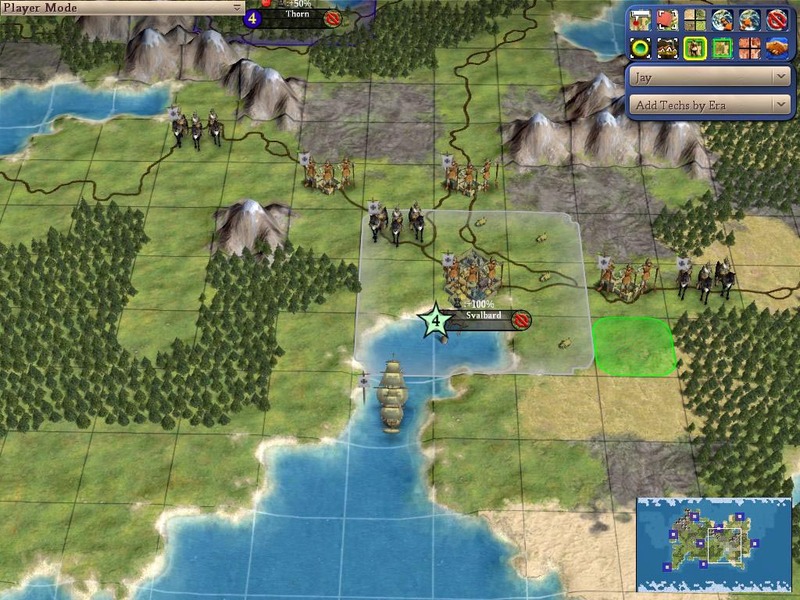 Civ4 will also help with record-keeping, enabling you to save multiple copies of each map to give you a permanent record of your campaign. You can zoom in or out to print maps at whatever level you choose, providing you with a hard copy to work with, or a digital copy to add in to your virtual campaign diary. Once you’ve got used to the idea of using Civ4 not as a game per se, but purely as an editor, it really does seem to tick all the boxes as a campaign and mapping tool. Note that this is quite distinct from playing Civilization with the world you’ve created in the usual way – what I’m suggesting means that you’re restricted to using it in WorldBuilder (i.e. ‘edit’) mode only. Each time you load the scenario you’ve created, you go straight back into the WorldBuilder to continue your campaign moves, edit the map and so on. Whether you use one of the many worlds created by the online Civilization community, tweak a computer-generated world, or build your own new world from scratch, I would seriously recommend giving it a try. Retailing for just a few pounds, I reckon it’s a sound investment for the budding wargames campaigner! Top of page: part of my newly-created island of Nylandia – an imaginary island created for a mini-campaign set in the Pike & Shot era. As you can see, this mini-campaign is going to be nice and simple! Bottom: zoomed-in shot showing the Swedish port of Svalbard, part of Nylandia and the base of operations for Gustavus’s invasion force. Civ4 Fanatics Forum – Creation and Customization Section. Everything you need to know to build your own world! Meet The Neighbours Part Eight – Game Over! Robert: 2. His force is struck by disease. 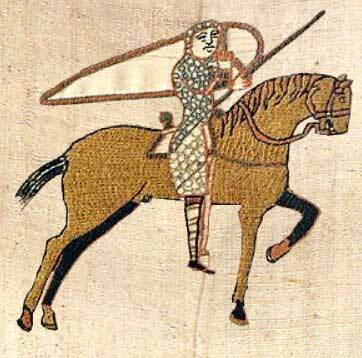 Two units are lost (Spears). Robert isn’t having much luck! Henry: 4. Barren lands. No effect, no further action. Robert: 6. Easy plunder. Better fortune for Robert this time. He picks up 50 gold pieces from the terrified locals. Henry: 5. Reinforcements arrive – one Knight element. Robert: 1. Desertion! 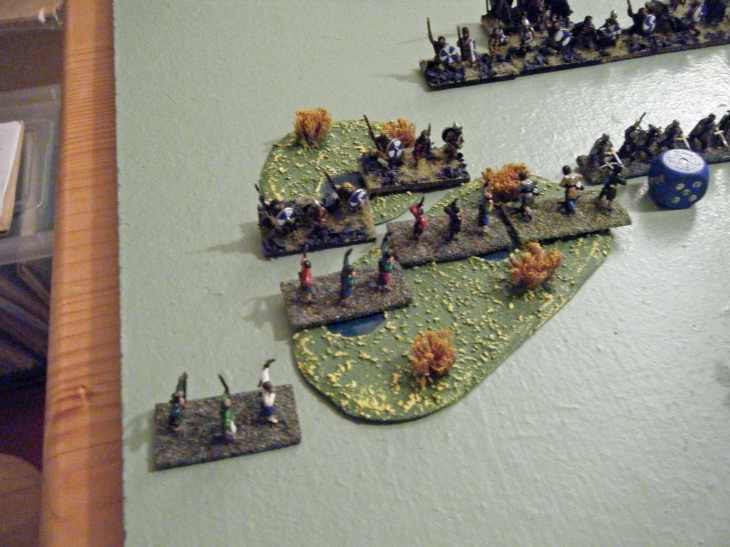 This is disastrous for Robert, one Bow element deserts, leaving him with just eleven elements in all. Henry: 6. Easy plunder – Henry adds 50 gold to his coffers as his good fortune continues. Robert: 9. Hostile force encountered! His depleted forces face an army of Vikings. Robert has no choice but to pay 100 gold in ransom and turn for home. His campaign has been dogged by bad luck from beginning to end. Henry: 1. Desertion! 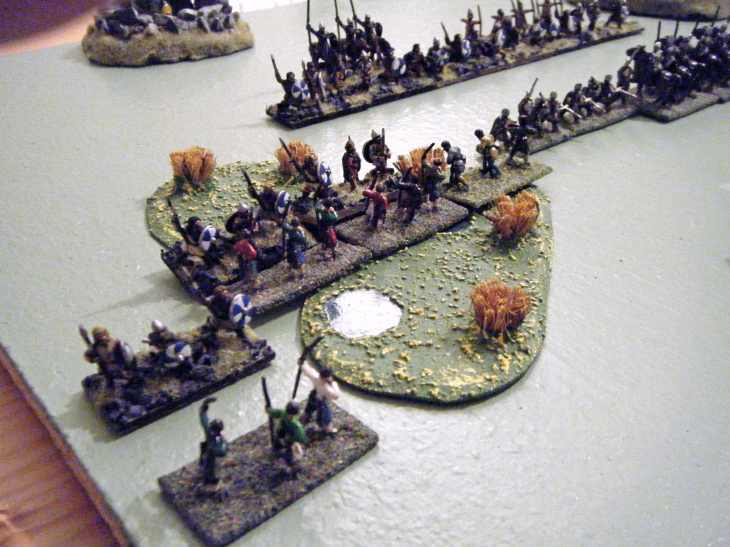 Henry loses one unit of Spears, but it is of no importance now, as his field army remains formidable. As a messenger arrives with news of his brother’s ignominious retreat Henry realises that he has won the day, with 600 gold pieces in his coffers to his brother’s 350, and much honour to his name. He too heads for home, but in far better spirits than his hapless brother. Henry has taken a giant step towards winning his father’s favour, and with it the dukedom. 3. Next time around I’ll avoid mixing the rulesets. I’ll also ensure that the campaigning armies will be more vulnerable – and that they’ll meet a good range of tough opponents! Turn 9: Robert and Henry both receive reinforcements of one Blade unit apiece. It’s another thumping victory for Henry, whose war chest at the end of turn ten stands at 550 gold pieces. Robert, in contrast, still has only 300 gold pieces. 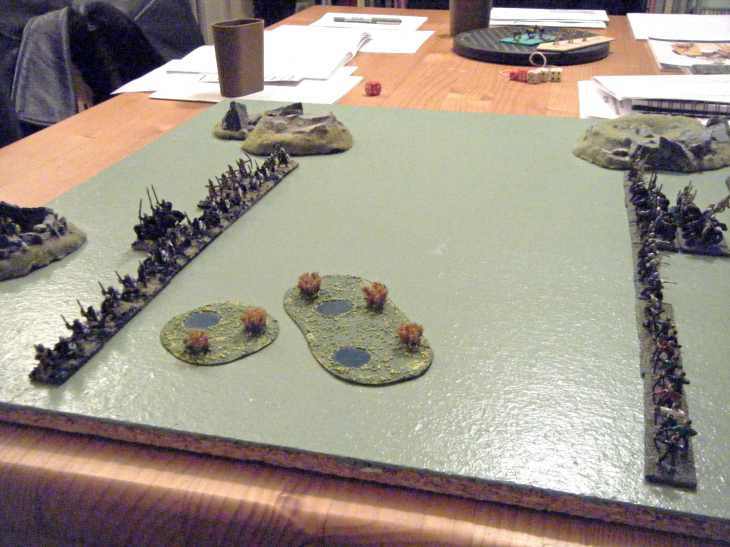 This guest post is by Jeff Herbert of the Hong Kong Society Of Wargamers . It sets out a really neat ancients micro campaign based around a pair of rather unfraternal Scythian brothers! Although this is not designed as a solo game it nonetheless contains lots of useful material and can easily be tweaked to play solo and to be used with other rulesets. All of the following material is © Jeff Herbert. Thanks for an excellent article Jeff! 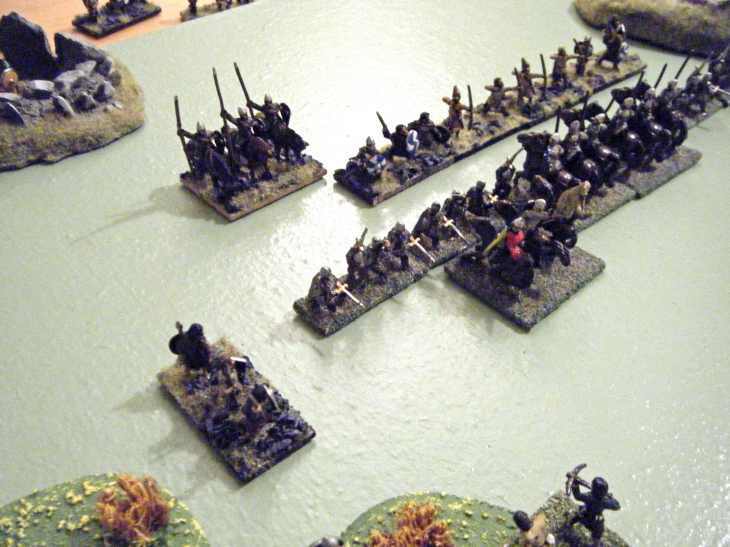 The ‘Sons of a Lion of Scythia’ is a mini campaign intended to achieve a result in one day of gaming. 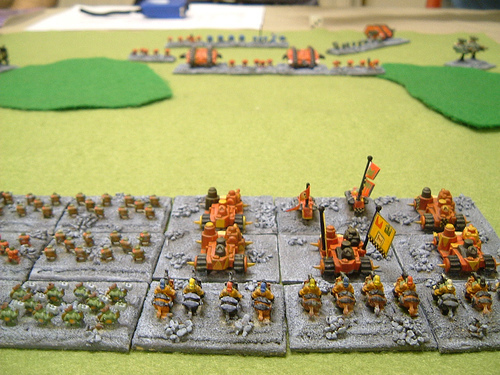 It is played by three main contenders and a number of other players to use the opposing armies. The ‘Old King’ of Scythia, known as the ‘Lion of Scythia’ is dying, and among his sons are three that are exceptionally bolder and better than the rest. The King knows full well that when he dies Scythia will be split by warring factions. So he decides it is better to pick his successor now, but to do so by clearly eliminating any contenders. The King sets a task for his three sons. They are to raid south of Scythia, each with an army of equal size but chosen by them. The son that returns with the greatest booty will be acclaimed heir. They may return at any time but the result will await the last to return, or news of his demise. There are no other rules. 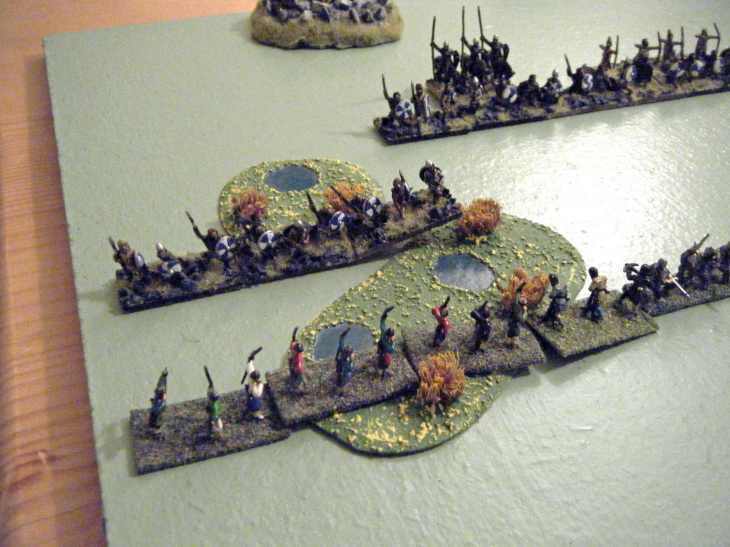 Each Scythian player starts with 120 points DBMM (supplied by me). Each player throws a D6. For each result, throw a D6 again. *** Gold is multiplied by the result of a D6 for final loot. 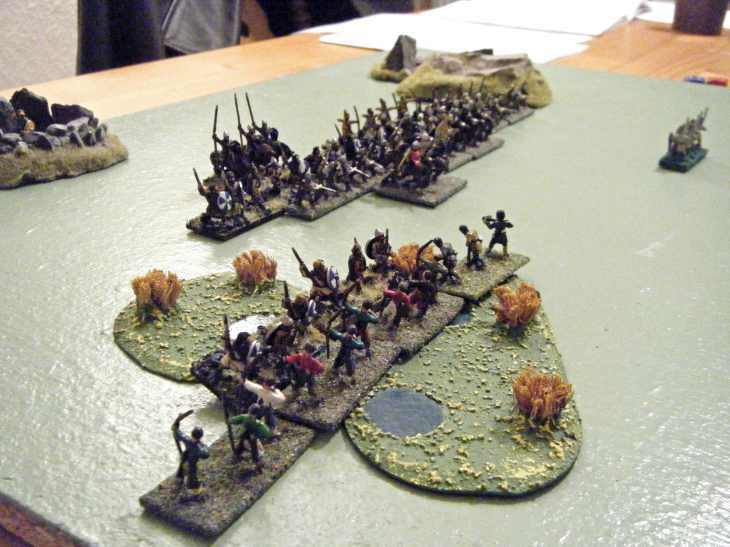 For each 10 gold gathered throw 1 D6, score of 1 indicates 1 base lost whilst looting. On winning battle Scythians get 5 gold for each ME of the enemy that is destroyed. SV/LV Small village Large Village ST/LT Small Town Large Town S/C Small City : this denotes battle takes place outside one of these. If Scythians win they also loot the village/town/city. Gold: SV = 5, LV = 10, ST = 20, LT = 100, SC = 250, all multiplied by score of D6. 5: Avoids but may turn to ambush enemy. Avoiding a battle outside a village, town or city means that they cannot be looted even if later defeating the enemy. On a roll of a D6 the following enemy is faced, if two enemy are listed dice again 1,2,3 or 4,5,6. The figure in brackets denotes the number of field armies available, ie: each 140 points of DBMM. None of these armies can repair themselves during the campaign. So the more they are attacked the weaker they become. If more than one brother fights the same enemy in a turn, they will fight the enemy available. This could mean 1-2-3 Scythian v 1, 1 Scythian v 1 x 1 or 2-3 Scythian v 2-3 on same battlefield. An enemy that is less than 50% of Scythian strength never fights but automatically cedes 100 Gold in tribute (to be shared if necessary). Scythians could choose their retainers but not their siblings. The sons are from three different mothers and all equally ambitious. They are all rated brilliant, if they lose more than 1 battle they are rated normal. They of course have feelings for each other which range from hate to pure contempt. After each battle they pick up a chance card. This card gives them various options if they are ever in the same area as another brother. If on any go two or more brothers miss a go or successfully avoid battle they are deemed to have fallen back on the same area. In doing so one or more may choose to fight. If they choose to do so their retainers may not all be so willing as they are. The umpire has a separate chart for this. Click here to download Umpire’s Notes (Word document). Space Crusade – Forth Across The Galaxy! 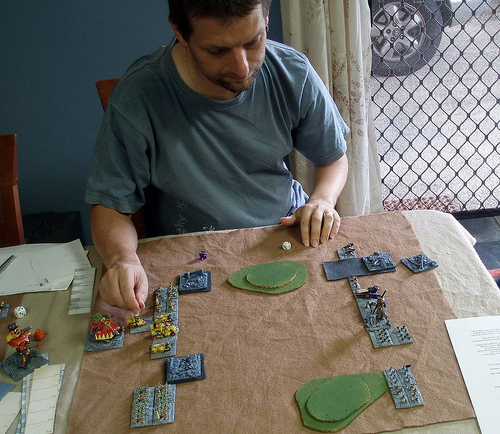 Thanks to Alan (pictured above) for another excellent guest post! All material in this post is © Alan Saunders. Inspired by Jay’s micro-campaign rules for DBA, and my own use of them for an Orks! Warhammer 40K campaign, I decided to try a variant set which would allow me to follow a chapter of Space Marines as they attempted to win glory for the Emperor and purge the galaxy of the taint of Chaos. Ideally this should be run with two chapters of Marines, each facing a different ‘flavour’ of Chaos. The chapter which wins the most glory wins the campaign. The Marine army should consist of 36AP of troops, the composition of which should be selected at the start of the campaign. It must include at least 12AP of Blades (Marines). When called to fight a battle, but before the opposing army is determined, a 24AP army should be constructed. This must include at least 12AP of Blades, but if insufficient numbers are available it must include all of them. The Marines set forth with one point of Glory. They will spend no more than 20 years travelling and fighting; at the end of this time they return home with whatever Glory they have accrued. 1 – Open Space. The Marines travel on. 2 – Warp Storm! Lose a random element from your army to the reserve. 3 – Reinforcements. Gain a random element from your reserve. If you have no elements in the reserve then treat as Open Space. 4 – Heretics! You purge a den of heretics, gaining one point of Glory. 5 – Attack Enemy Army. Choose the makeup of your force, then roll on the table below to see who you have encountered. You are the attacker. 6 – Enemy Army Attacks. Choose the makeup of your force, then roll on the table below to see who you have encountered. You are the defender. Roll to determine foes on the following table. Each chapter may only encounter each foe once (Exception – a roll of 7+). If a foe has already been encountered, then do not reroll. Instead move one number up the table. For example, you roll a 4. You have already encountered the Evil Sunz Orks, so instead the roll becomes a 5 and you encounter Chaos Space Marines. The upshot of this rule is that, as time goes on, you will encounter more Chaos, and be playing for higher stakes. 7+ – Chaos. Equal chance of Marines or Demons. If you win you gain two Glory. If you don’t you lose two Glory. Armies should be based on the lists linked to above. Use whatever means you deem suitable to determine the composition. 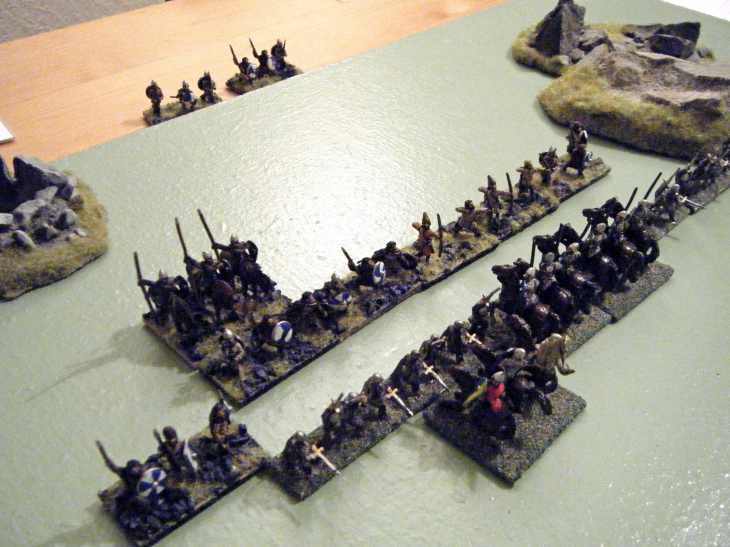 On a ‘6’ you may swap 4AP of your army for two Warband elements. This represents assistance from the death-seeking Legion of the Damned. On a ‘5’, and only if you are facing a Chaos army, you may swap 4AP of your army for a Paladin element – the demon-hunting Grey Knights. On a ‘4’, and only if you are defending, you may swap 4AP of your army for four Horde elements – local planetary defence troops. These are not a permanent part of your army pool, so their loss has no long-term effect on your chapter’s fortune. You choose which elements are swapped out of your army for the battle, but you must retain the compulsory core force (Six Blades). Any elements which fled or moved off the table are automatically returned to your forces. If you won the battle you gain one point of Glory (two for a roll of 7+). Roll a D6 for each destroyed element – you get it back on a 1-4. Otherwise it goes into the reserve. If you lost the battle you lose one point of Glory (two for a roll of 7+). Roll a D6 for each destroyed element – you get it back on a 1-2. Otherwise it goes into the reserve. If you lose a battle and do not have enough Glory, your chapter is disbanded in disgrace. You have lost. If your force drops below 24AP then you can head for home straight away with whatever Glory you have, or continue. You still gain Glory for purging Heretics, and might gain reinforcements. However if you encounter an enemy force, and still have less than 24AP available, you must immediately head for home, losing either one or two Glory in the process depending on which force you encounter. Once again, if you have insufficient Glory to do this then your chapter is disbanded. Otherwise you arrive home with whatever Glory you retained. 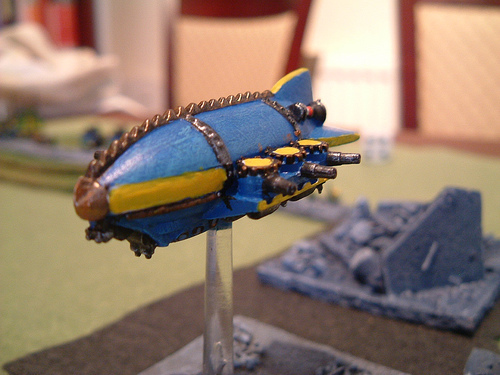 Comments Off on Space Crusade – Forth Across The Galaxy! Alan Saunders, a.k.a. the Godfather of HoTT (Hordes of the Things), recently created his own version of the micro campaign rules to run a HoTT Epic 40K campaign. Thanks to Alan for the following report and for the pics. You can find much more HoTT material on Alan’s superb Stronghold website, BTW! At lunchtime I was reading Jay’s ‘Solo Wargaming’ blog, when I came across the rules for a micro-campaign he had posted a month or so ago. Intrigued by his reports, and with nothing better to do this afternoon, I decided to give it a go. Since they happened to be the armies on the table at present, I decided to use my Epic 40K ones, and decided that the two forces who would be heading out into the stars looking for death, loot and glory could only be Orks. Each force was 36AP. An army had to consist, as far as losses allowed, of one Behemoth, four Hordes, and two Warband, plus 12AP of other troops. The army composition for a given battle was determined after the race of the opposing army had been determined, but before its makeup was known. Since I use semi-random lists, it was possible to have some idea of what the opposing army would have, but not precise information. 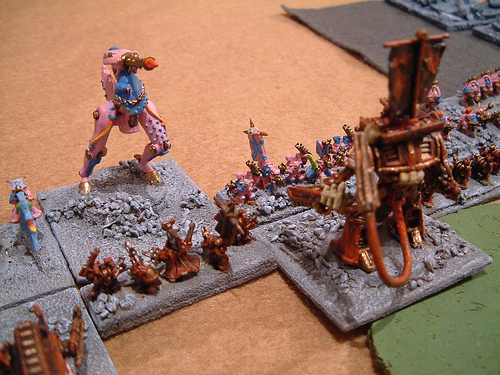 There were six possible forces the Orks could encounter – Marines, Imperial Guard, Necron, Eldar, Squats and Chaos. All six had to have been encountered before a repeat was allowed, and which force had been met was randomly determined. I used a system of my own to decide the makeup of each army; basically they have a fixed 12AP core, with the other 12Ap being decided by die rolls from a pool of possible elements. ‘Gold’ became ‘Loot’, but the numbers stayed the same. ‘Barren Lands’ and ‘Bad Terrain’ just became ‘Open Space’ and ‘Asteroid Fields’ (or whatever). A force had to have at least 24AP to be viable. Replacements, reinforcements, desertion and returned casualties were determined by elements rather than AP. This seemed to balance out fairly well; the roll could gain or lose you a 4AP element just as readily as a 1AP one. As with the normal HOTT campaign rules, elements which fled or left the field automatically returned to the army – they only counted as losses for the purposes of determining if the battle was won or lost. I won’t bore you with a detailed account of the campaign itself. However the Bad Moon clan immediately found the Eldar, and defeated them, but then ran straight into the Space Marines and lost. Cumulative casualties from the two battles dropped them to 20AP; they wandered an asteroid field for a while, lost more troops to desertion, then fled from the Necrons, returning home empty-handed. The Snakebite clan fared little better. After wandering the galaxy for a while they ran into a Chaos army, and defeated it. The picked up some reinforcements, but then encountered the Squats and were defeated in a close, desperate battle. Still with enough troops to continue they forged on, but an Imperial Guard army proved too much for them; in a confused battle which saw 20 Hordes fielded between the two armies they were virtually wiped out. An attempt to sneak around looking for easy pickings was thwarted when the Imperial Guard appeared again (all six armies had been encountered), and the Snakebite clan fled for home, also empty-handed. The Bad Moon clan survived six rounds, the Snakebite clan 15 rounds. Five actual battles were fought. The whole thing took about four hours to set up and play. Thanks to Jay for an entertaining afternoon’s diversion.